Whether it be a train or bus, passenger load data solutions are more important in your daily commute than you may think. Everyday transit operators rely on data to plan operations and put their transit assets on the right route, at the right time and for the right duration. Without real-time data, transit managers cannot accurately evaluate the quality and productivity of existing transit services, and more importantly, passengers, you, may be left waiting in uncomfortable weather. One such company providing real-time data solutions is Urban Transportation Associates, Inc. (UTA). UTA gives immediate insight into individual route segments, enabling transit planners and operators to fine-tune routes quickly in response to changing travel demand. They worked with CalAmp channel partner, Applocation, to integrate CalAmp’s LMU-4225 and LMU-5530 into their UTA Advanced APC System. 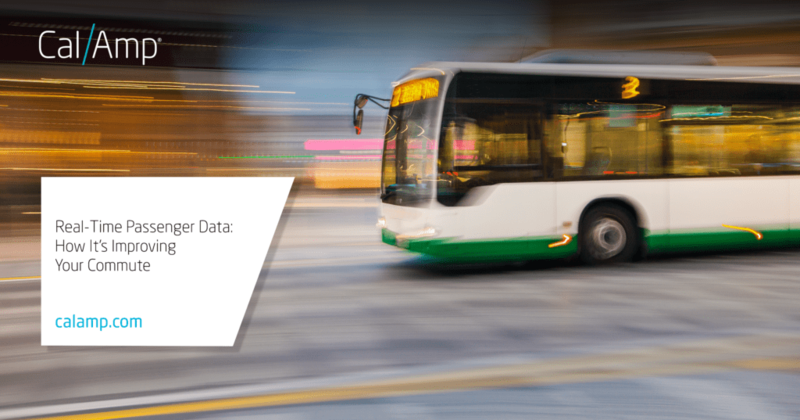 These data transmissions are achieved by installing CalAmp technology on a variety of transit vehicles including buses and rail systems delivering continuous location and passenger load data information. Passenger count data is then sent immediately over broadband or logged for later Wi-Fi collection via store and forward. Additionally, the devices can connect directly to vehicle engines via the J1939 interface to provide real-time fuel economy and emissions data, as well as predictive maintenance alerts and engine fault information. Over 50 of the largest transit authorities in the U.S. and Canada already benefit from integrated UTA solution. The next time your bus arrives on time or you’re able to catch a last minute train, you have passenger load data solutions to thank. To learn more, read the case study, Real-Time Passenger Load Data for Improved Transit Efficiency, which can be downloaded here.